With the ‘flu season’ rapidly approaching we thought it might be interesting to look back at how it was dealt with in Georgian England before the advent of vaccines. 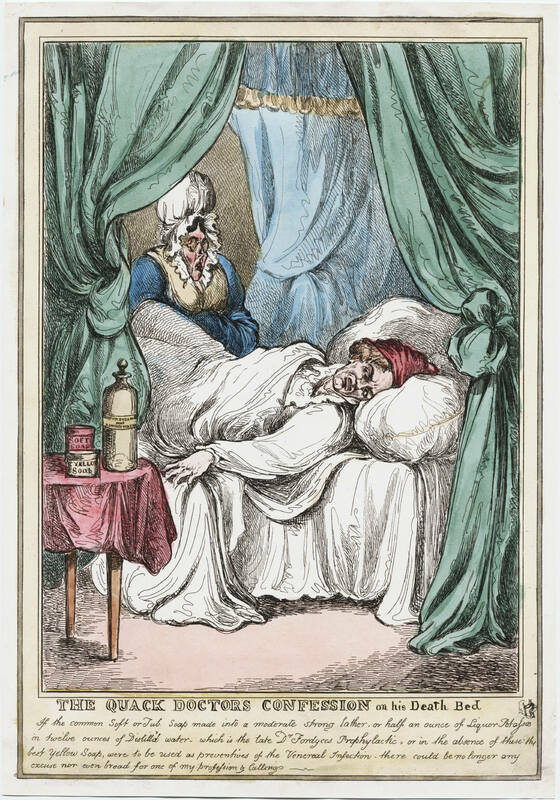 Most of us have at some stage suffered from influenza although statistics show that in most years relatively few people died as a result of the virus alone however in certain years for some reason there were epidemics causing far more deaths than was the norm – the winter of 1775-1776 being one such occasion. Weather reports in the newspapers confirm that the winter of 1775-76 was especially severe. The Thames was frozen for some considerable time, this was followed by severe frosts during January and an intensely stormy February. This cold weather could potentially have made it easier for the pandemic to spread* combined with poor housing, sanitation and lack of appropriate medicines. During this particular winter, it was reported that somewhere in the region of 40,000 people died from the epidemic. This report in the London Chronicle dated 19th December 1775, on the other hand, is quite amusing – could it have been a typo?? Whilst we shouldn’t mock, this would be quite an interesting to have witnessed the following day! …a correspondent says, some Gentlemen in a coffee-house a few days ago speaking of the present fashionable influenza and how generally people throughout the Kingdom were complaining of being affected by it – a gentleman lately arriving from Tipperary assured them that it raged more violently in Ireland and was attended with much more fatal consequences, for to his knowledge, for many people who went to bed well at night, got up dead in the morning. 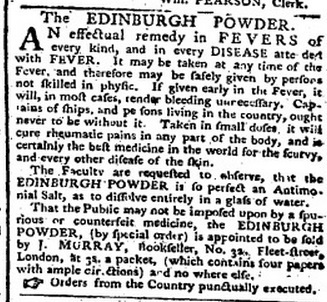 How to treat influenza – well, The Public Advertiser in November was recommending the use of Edinburgh Powder as being the most effective cure for influenza but whether or not it was effective in this we couldn’t possibly confirm or deny. The Middlesex Journal and Evening Advertiser of the 25th November 1775 reported that two-thirds of the city of Dublin had influenza or ‘epidemical cold’ so presumably it wasn’t working for the people of Dublin. We also came across another remedy in the newspapers – ‘Daffy’s Elixir’ that was highly recommended as a cure for influenza and was especially beneficial for the nobility and gentry. This product was regarded as being a ‘cure for all ills‘, the reality was, that it given its ingredients of aniseed, brandy, fennel seed, jalap, parsley seed, raisin and senna amongst other things – it was more likely to cure constipation rather than influenza! Weeks later a newspaper that the epidemic was raging across the country, but most curiously that the Isle of Thanet, one of the healthiest places to live in the country was severely suffering, so much so that ‘the parson was sick, the clerk was sick and a large part of the parishioners were also sick, that it was judged expedient to shut up the church for the day and to leave the good people at home to pray for each other.’ Reports also mentioned physician John Fothergill was reported to have seen around 60 patients per day during the epidemic. By the end of February 1776 reports in the newspapers ceased, so presumably, the epidemic was over and Spring on its way. It may be of interest to note that the Edinburgh Powder was most widely promoted and advertised in London by the Scots bookseller John Murray, founder of the publishing empire that would be home to Jane Austen and Lord Byron, among many other “bestsellers”. His letters during the years 1774 and 1775 often talk of the Powder as a wonder drug and refer to his efforts to advertise it in the newspapers and on magazine wrappers.